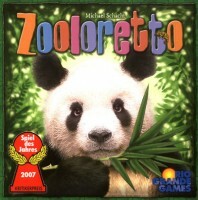 Zooloretto has broad appeal in that it attracts younger kids to play, yet has good strategic depth for older players. Zookeeping may sound boring to you, but inside this gem is a competitive masterpiece. In Zooloretto, players are competing to build a better zoo that scores more points in the end. Each player can choose one of three actions during their turn for each round: add a tile to a delivery truck, perform a money action (5 kinds), or pick a delivery truck therefore ending your turns for that round. Once each player has picked a delivery truck, the round is over. Players then place their tiles (animal, money, or vending stall) in the appropriate location, then put their trucks back to start the next round. Last player to grab a truck goes first the next round. That’s pretty much how the mechanics go. Now, the strategy involved centers around what you can put in your zoo. You can only have one kind of animal in each of your fenced in areas. If you don’t have room for an animal because of wrong type or too many, that animal has to go in the barn. Any type of animal found in the barn at the end of the game is negative two points. Each vending stall found in your barn at the end of the game is negative two points instead of positive two. You really have to manage your zoo allocation well to maximize your points and to get more coins. Some fenced in areas give you coin bonuses if you fill them out completely with animals, so long at the last animal in is not a baby. Even though you start with 3 coins, money is hard to come by in this game, and you’re going to need the coins to either get rid of those animals in the barn or buy an animal from a player to finish an area. Vending stalls are vital to maximize your points in areas where you have few animals. Even though Zooloretto could devolve towards multi-player solitaire if everyone wants to play nice and not care who wins, it can get kind of “cutthroat” for those who are competitive. The key part comes down to when you pick up a delivery truck that someone else might want or putting tiles on trucks that hose over a truck that someone would have wanted. It has some mild “take that” factors indeed. There can also be some negotiation going on towards the end of the game when players are trying to figure out how to get rid of animals in their barns and try to convince other players to purchase some. I really enjoy playing this game with 9 yr old daughter. I bought it for “her” on her birthday, and she immensely loves it. She was a big fan of Zoo Tycoon anyway, so it was an easy pick. I’ve taught it to a few others, and so far they have enjoyed it as well. I did have trouble understanding the rules at first, but as we played it became clearer. It does take a while to setup all the animal tiles, especially with lesser players where you have to remove some animals while you setup. However, with others helping setup, it’s not so burdensome. I highly recommend this very fun little game. While many board games have been scaled down to become decent card games, this is an example of a great card game being scaled up to a very good board game. I have strategically used Coloretto in combination with Zooloretto to progress many of my friends into the world of strategy games. It’s easy to learn and great for the whole family. The artwork in this game is beautiful and the components are high-quality; and the rules are easy to read and clearly worded. I recommend this game as a solid light strategy game for all ages. Add a Review for "Zooloretto"